Crew length bamboo sport socks. Ultra soft, breathable and moisture wicking. Sporty bamboo crew socks. Ultra soft, breathable and moisture wicking. Machine washable. Dryer safe. Do not bleach. 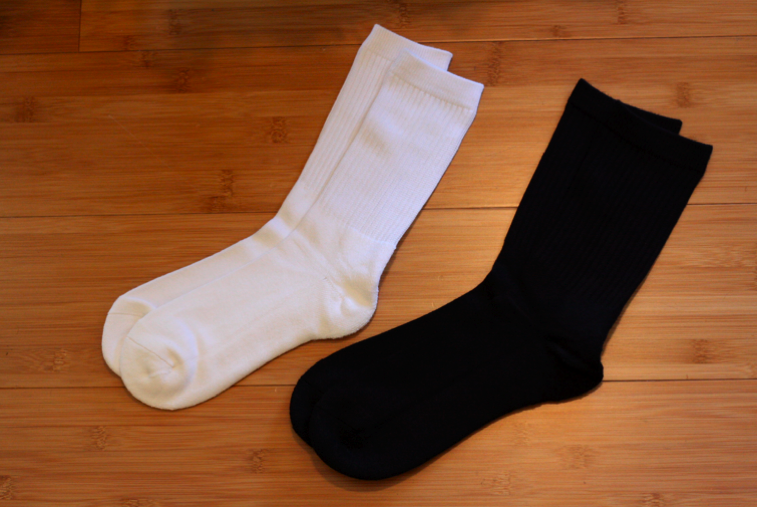 Since we first started carrying bamboo clothing back in 2006, these bamboo ankle socks and crew socks have been some of our hottest commodities. These socks probably bring us more return customers than any other item in the store. It’s no surprise, really. After all, who doesn’t enjoy a good sock? The softness of bamboo gives these socks their immediate appeal, but it’s more than just the softness that keeps people coming back for more. For those of us who spend most of the day on their feet, bamboo is a game changer. Imagine walking on a cloud of pillows, all day long, and you get some idea. People are always telling us about how much they love the breathability of this fast growing fabric. Breathable, moisture wicking, odor resistant, they’re the perfect remedy against itchiness and perspiration. You can also thank bamboo’s anti-bacterial properties for that. And you will notice the difference at the end of the day, the way bamboo doesn’t hold the odor like cotton socks. Like the bamboo underwear, people usually try one or two pairs, and soon they are coming back five or six. “My wife keeps taking my bamboo socks,” as we are often told. There’s no doubt about it, they are fun for the whole family, so they also make great gifts for both tried and true bamboo-lovers as well as the uninitiated. Indeed, at Christmas time these crew socks don’t just walk out of the store, they run! They do make fine stocking stuffers, after all.